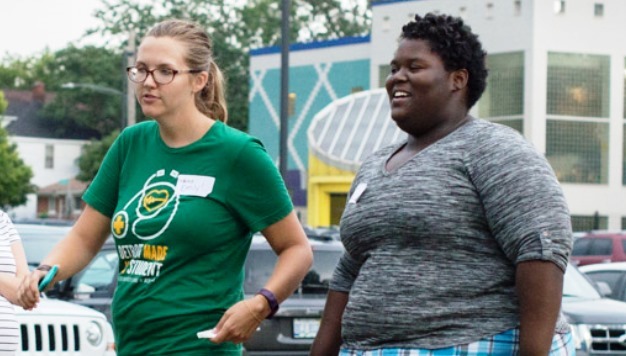 A group of Wayne State University School of Medicine medical students utilized part of their summer to mentor Detroit children and their families as volunteers for the Wayne Children's Healthcare Access Program's FitKids360 and related Fit Kids On the Move in the D program, preparing more than 100 participants for the Aug. 26 In the Cut 5K Fun Run/Walk in Detroit's Chene Park. The run is expected to be the first 5K for many participants, who are overweight children learning -- with their families -- to make healthy behavioral changes. The medical students work with each child to support the family and help the child complete the race. School of Medicine students also are members of the School of Medicine's FitKids360 student group, and earn Co-Curricular Program credit in four sessions throughout the year for serving as mentors to overweight and obese children and their families, providing nutritional and educational guidance, motivation, activity monitoring and more. Fourth-year medical student Rachael Pettapiece-Phillips is using data from the program to present a poster about the students' efforts at the Alliance for Academic Internal Medicine Skills and Leadership Conference, to be held Oct. 19-21 in Grapevine, Texas. FitKids360 is an eight-week childhood obesity intervention program that targets children 5 to 17 years old who have a body mass index in the 85 percentile or above. The program curriculum is taught by a social worker, registered dietitian and fitness expert, and includes about one hour of exercise per session. Participants who complete the program are eligible to participate in the On the Move program, a 12-week extension program that ensures each family is successful by pairing each child with a mentor during the program and providing weekly training guides so families can train at home for a 5K race. Both programs are free. "We have a wonderful relationship with our WSU medical students, and they are instrumental to our program," said Krista Siddall, director of Programming and Operations with the Wayne Children's Healthcare Access Program. "The WSU students are involved in both programs, and are one of the big reasons that FitKids is as successful as it has been lately." Students meet with a mentee and their family every week for two hours, building trust and rapport. FitKid mentors serve as friends, role models and motivators in an attempt to help their mentees make healthy lifestyle modifications. In addition, the medical students were among the families, running enthusiasts and physicians who, with assistance from the Children's Hospital Foundation and the WSU FitKids student group, came together Aug. 3 to provide new running shoes and socks to more than 50 children planning to run the race. "Children today face a grim future of higher rates of diabetes, heart disease, mental health issues, cancers and shorter lifespans as they grow up in today's fast-paced world. Keeping kids active and healthy into adulthood is even more important today than ever before," said Teresa Holtrop, M.D., F.A.A.P., executive director of the Wayne Children's Healthcare Access Program. "The Fit Kids On the Move program is a great example of how a community can come together to provide greatly-needed opportunities for families and children to learn how to be active, how to exercise and, in this case, how to run. The plan is not to end at eight weeks, but to keep them going and learn an activity skill they can continue with for years to come." Participants train at Patton Park in Detroit by running and walking for a predetermined amount of time each week, followed by a movement session that includes dance, Zumba, karate and Cross Fit. Registered dietitians and fitness experts are at every meeting to teach participants how to properly fuel their bodies for exercise and ensure safety and proper form. "Additionally, we have found that the use of behavioral health experts has helped us to ensure not only are our families physically healthy, but mentally healthy as well," Siddall said.